You cannot choose your neighbours, but in this cabin, I wished I could have. My travel agent did not give me a choice of cabins, so cabin number 10255 tucked away at the rear of Deck 10 was my only option. 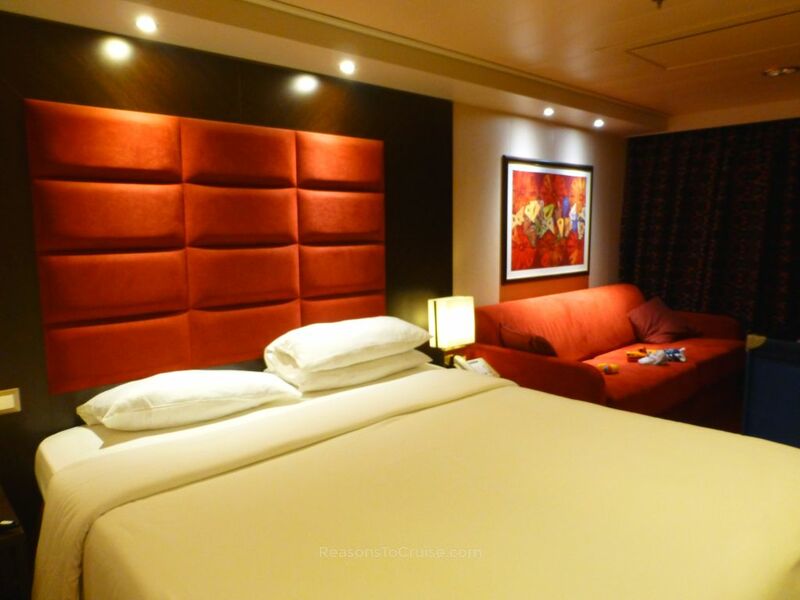 The décor of this cabin on MSC Preziosa was clean and modern and made use of dark woods, vibrant reds, and creams. Oversized wall-mounted mirrors help bounce light around the cabin. 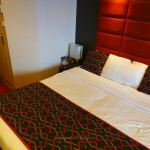 The main cabin space contains a comfy, oversized sofa-bed next to twin beds pushed together to form a large double bed. An oval coffee table sat in-between the sofa and dressing table. 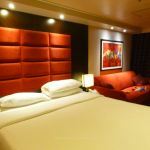 A flat-screen television sat on a shelf though only three of its 30 international channels streamed English programming – and these were out of signal for the duration of the cruise. Storage cupboards stand opposite the compact yet functional bathroom. The shower benefits from two curved doors, but the location of the toilet means only one door opens. 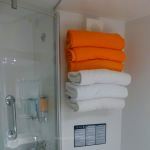 By the sink, there is a liquid soap dispenser, and in the shower, there are containers of orange and blue shower gel and shampoo. 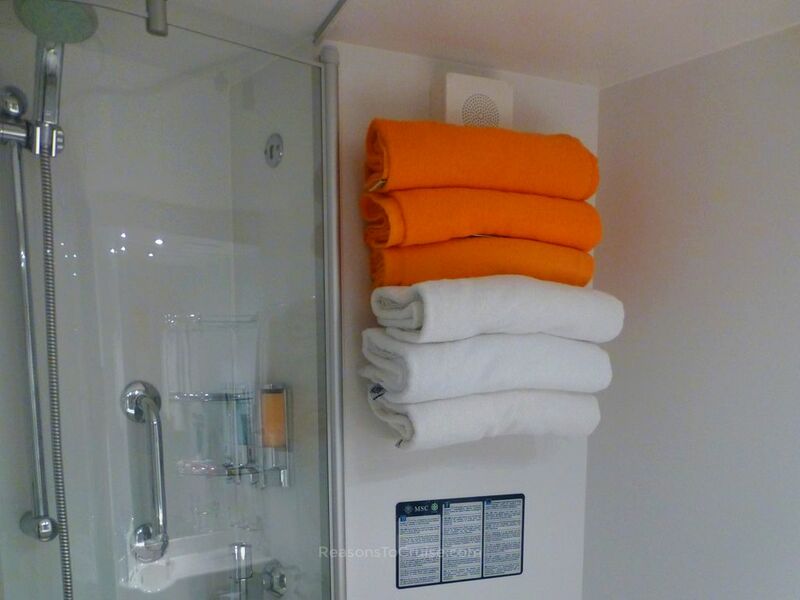 Plenty of white and orange towels (for cabin and pool use respectively) lined the wall-mounted rails. 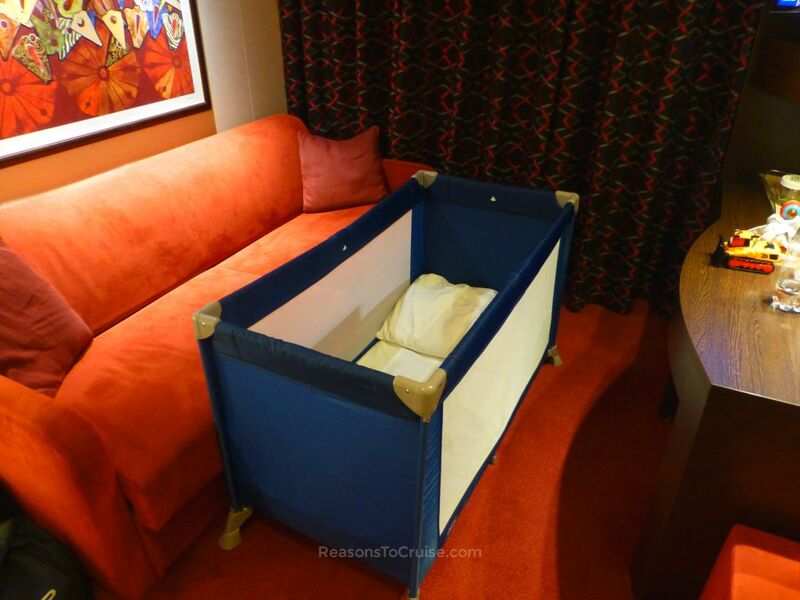 MSC Cruises supplied a Chicco-branded travel cot for the duration of the cruise. I had requested this from my travel agent, but the ship did not receive the message. My cabin steward was professional, efficient, and hard-working. 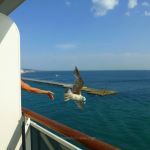 Sadly, he was a man of few words, so building up a rapport was difficult, unlike on other cruise lines. 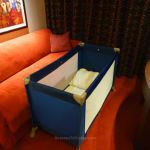 The generous floorspace, even with a cot erected, was a wonderful surprise. Complimentary toiletries mean there are a few less bottles to pack. As a bonus, these liquids smelled lovely. I could rarely enjoy time on my balcony due to the constant wafting of cigarette or cigar smoke from neighbouring balconies. Smoking on balconies was rife despite the unenforced ban. Cigarette and cigar smoke also drifted into the cabin through the air conditioning system. Noise travelled across the balconies, with shouting a regular occurrence. Evidently, these are not balconies for relaxing. 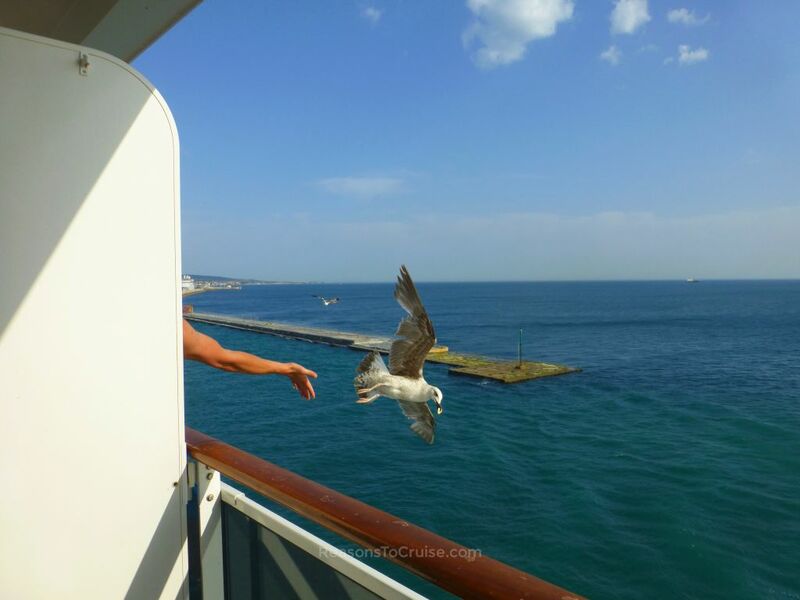 Throwing food from the ship to the swarms of seagulls is an odd practice that goes on. Guests threw bread, crackers, and crisps overboard. One tried feeding a whole unpeeled banana to a desperate gull. 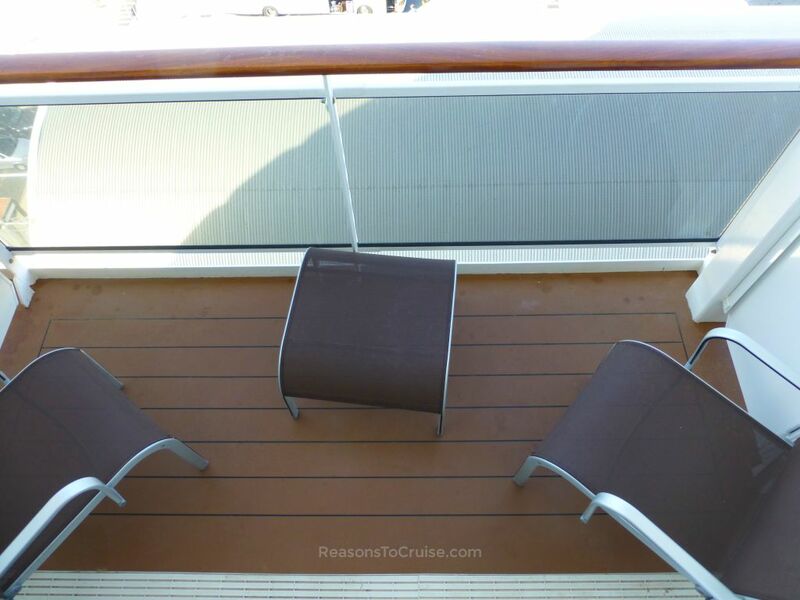 The Promenade deck below was littered with food waste after each port departure. The cabin location meant that I awoke to severe shuddering caused by the propulsion system as the ship manoeuvred. The vibrations on Deck 10 were insignificant compared to those felt on Deck 5 where I watched crockery dance precariously close to the edge of shelves in L'Arabesque during one manoeuvre into port. 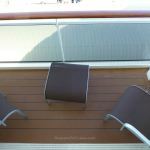 Have you sailed with MSC Cruises in a balcony cabin? Did you have a different experience? Let me know in the comments below. Disclosure: I paid for this trip in its entirety. My opinions are my own. 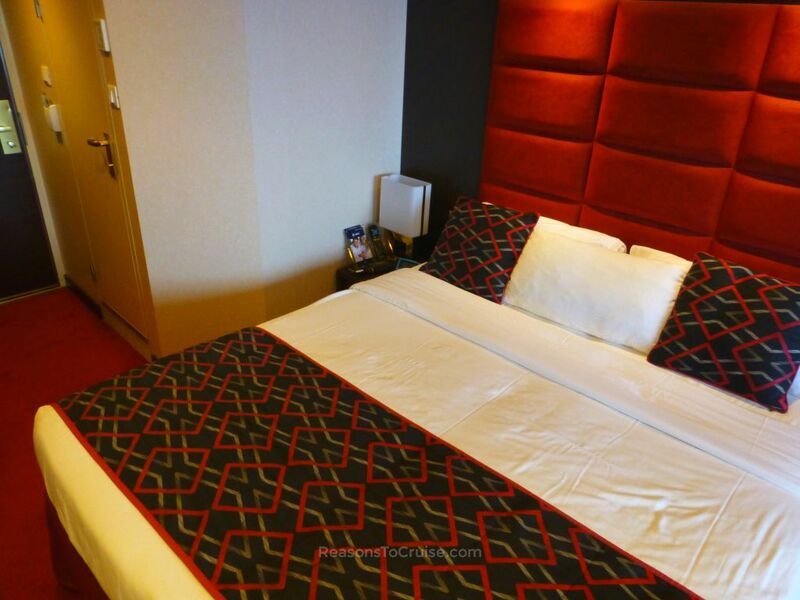 A good, comfortable cabin overall thanks to plenty of floorspace. The balcony was not so private, and wafting cigarette and cigar smoke along with excessive noise from my neighbours meant this was not a relaxing place to enjoy.